Conceptually, Vistaar’s solution can be represented in three layers. The foundation layer consists of an enterprise-class platform that provides all the analytic, workflow, transaction, and interface services. The platform is unmatched in terms of its scalability, modularity, flexibility and extensibility. 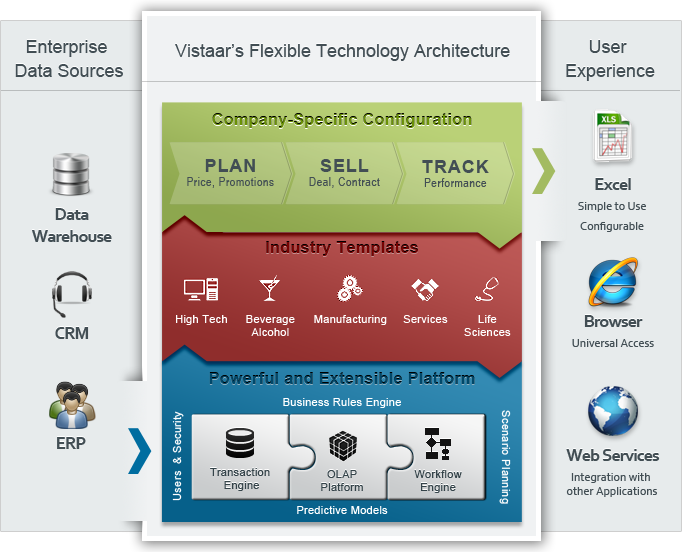 The middle layer consists of Vistaar’s industry templates that reflect the specific business structure, pricing processes and environment of specific industries. Finally, the third layer is the “configuration” layer which is tailored to a customer’s specific business. The power of Vistaar comes from its unique ability to configure the pricing model, company structure, business rules, and pricing science in a way that is specific to a company's needs and all within a familiar, easy-to-adopt Excel/Browser interface. It’s this capability that enables Vistaar to deliver more value with fewer surprises than some of the more rigid, one-size-fits-all solutions on the market.